Typo3 is a powerful Open Source content management system that runs on system that support recent versions of PHP and MySQL. Linux users usually do not have a problem installing PHP and MySQL on their systems, while Windows users may have troubles finding a solution to run them on their system. Typo3 Winstaller is a free WAMP (which means Windows, Apache, MySQL and PHP) webserver that comes preinstalled with the Typo3 content manangement system. It basically offers everything needed to get started eliminating the need to install and configure the dependencies individually. 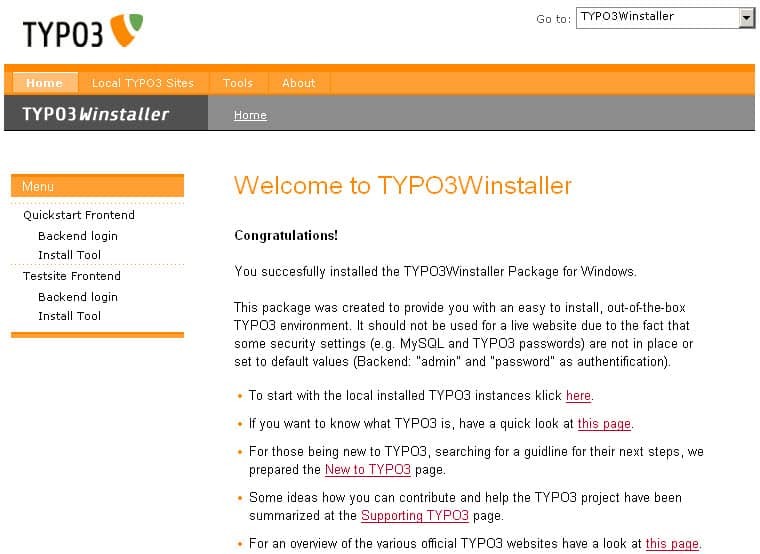 The installer sets up a full Typo3 environment on the system that can be used immediately without configuration. This can be helpful for developers, students, employees and everyone else who wants or needs to work with Typo3. The package is offered as a zip file and executable. The executable handles the unpacking for the user, the remaining process remains the same. The application offers a basic control panel that displays information about running services (Apache, MySQL), options, logs and the ability to start and stop the Typo3 content management system. Typo3 runs on the local system. The control panel launches the web interface in the default browser after installation or manual activation. This is at the same time the final test that everything is up and running. The welcome page links to several Typo3 related resources which is handy for beginners who want to learn Typo3. 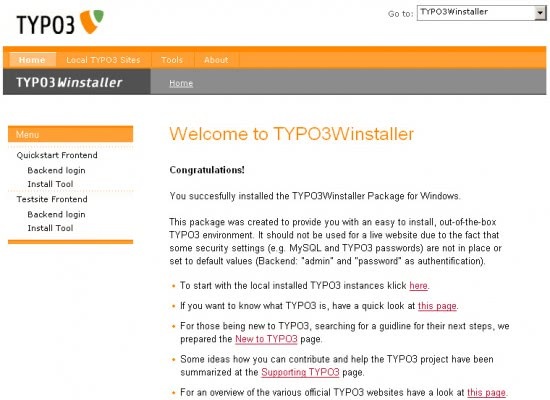 Interested users can download Typo3 Winstaller from its project page over at Sourceforge.